Álvarez de Laviada Mulero T. Evaluation and management of the child with developmental impairment. Pervasive developmental disorders. Presentation. Rev Pediatr Aten Primaria. Supl. 2011;(20):127-9. Barona Zamora P, Asensi Monzó M, Úbeda Sansano MI, Sánchez Medina CM, Álvarez de Laviada Mulero T, Fabregat Ferrer E, et al. P-7. 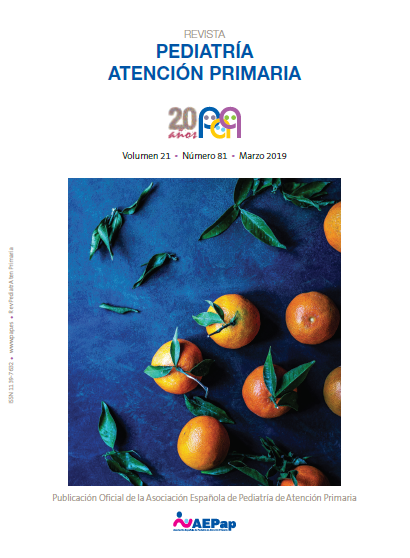 Current situation of asthma approach in Primary Care Pediatrics in the Valencia Community. Rev Pediatr Aten Primaria. 2010;12(Supl 19):e88-e89. P-15. What amount and variety of pharmaceutical compounds are there available for common cold treatment? Polo Martín P, Álvarez de Laviada Mulero T. P-15. What amount and variety of pharmaceutical compounds are there available for common cold treatment? Rev Pediatr Aten Primaria. 2010;12(Supl 19):e98-e99. Fuentes Leonarte V, Serrano Poveda ME, Álvarez de Laviada Mulero T, León Bello G, Marco Macián A, Rebagliato Russo M. Kind of milk feeding in the infants of INMA birth cohort (Valencia). Rev Pediatr Aten Primaria. 2008;10 Supl 2:e87-8. Fuentes Leonarte V, Serrano Poveda ME, Álvarez de Laviada Mulero T, León Bello G, Marco Macián A, Rebagliato Russo M. Appropriateness of the use of supplements in the first year of life in the children of INMA birth cohort (Valencia). Rev Pediatr Aten Primaria. 2008;10 Supl 2:e88-9.